What does 3 days, 20,000 visitors, 1,400 motorcycle industry employees, all major manufactures present, 125 booths, an MX Extreme show and hundreds of new motorcycles from all the manufacturers make? One great motorcycle show.. The Calgary 2004 Motorcycle show to be exact. The Calgary Motorcycle Show is now in it’s 3rd year and growing. We were there to see the first and second one s and last year’s (2nd) was even bigger and better. So hopes are high that the 3rd year will surpass the first two years. The Motorcycle Show celebrates its 3rd annual event, which is the largest annual industry gathering in Calgary featuring the newest 2004 bikes, ATVs and accessories. Major manufacturers, more than 125 exhibitors, dealers and local experts offer the latest information and trends that have anything and everything to do with motorcycles and ATVs. I looked at my watch, 1:00pm, and there was still a wrap around the block lineup of excited visitors just eager to get in. I can’t believe it’s been an hour already since opening and the 2004 Calgary motorcycle show is now in full swing. There was so much to see this year at the Calgary motorcycle show that you got to experience the best motorcycle show ever in Calgary. For those who were not there, read on and enjoy! I look at my watch, 1:00pm, and there is still a line-up of excited visitors that resembled a “round-the-block” Boxing Day crowd, eager to get in. 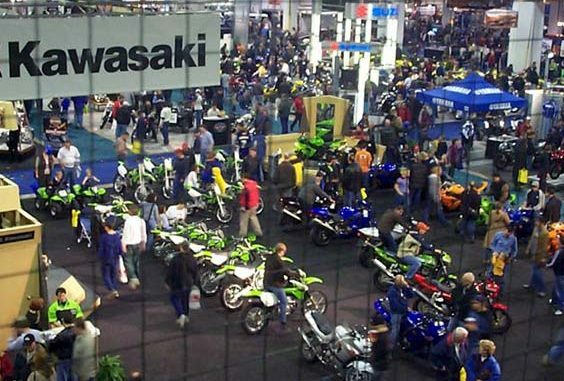 I can’t believe it’s been an hour already since opening and the 2004 Calgary motorcycle show is now in full swing. The first thing we were privileged enough to be invited to was the special media presentations of the fashion show and MX extreme show. The fashion show was short and to the point, yielding new casual but more practical jeans for riding, which contained knee padding. Jeans are the new “in” thing to wear this year, and now the big manufacturers are getting into the act , with more motorcycle jean styles than ever before available for 2004. Ladies motorcycle jackets are coming along, being fashionable without looking like you just stepped off a motorcycle. New Men’s boots hide the laces ( for safety ) and now visors can be purchased in a tint to match your helmet. Motorcycling can be dangerous so safety gear is a necessity, and now you can be safe and stylish like never before! The freestyle MX extreme show is a fast-paced sport where riders launch themselves off ramps while performing acrobatic tricks, such as the “Kiss of Death” . This is a trick where riders ” kiss ” the front fender of their bikes while in the air. The freestyle demonstration headliner is Team Outlaw rider Kris Garwasiuk, Canada’s first professional MX Freestyler and the only Canadian in the sport featured in a video game ( Championship Motocross by THQ ) . 4 superstar riders on 250cc 2-Stroke Kawasaki’s jumping a 10′ ramp and 30′ into the air, performing tricks such and then landing 75′ away! WOW! If the thought of that doesn’t make your heart pound, then you just have to see it in person! We took some great photos of all the intense action to show you all! The Freestyle Motocross Aerial Acrobats were an addition to this year’s Calgary Motorcycle show. We also had the chance to interview two of the upcoming superstars, Mike McGaw from Team Outlaw and a great Canadian trials rider Ryon Bell. We also got photos of some great trials action too. (see our interviews with Team Outlaw) The riders perform incredible aerial acrobat, in the short time that they have in the air, from the kiss of death to the cliff-hanger and more. It was a great show… all the riders were very excited about performing in front of the media as our cameras were taking photos almost as fast as the engines of their bikes. Even with auto focus on high speed cameras , we were just fast enough to match their speeds. Though only five or six years old, the fast-growing extreme motorcycle sport is characterized by young riders. Serious competitors are generally 15 to 22 years of age with a motocross background and bravado. Freestyle motocross can be traced to the 1980s when BMX riders performed tricks that were highly publicized in documentaries during the 1990s. Motocross riders began to adopt aerial tricks and stunts to show off when they were so far behind in races they had nothing else to lose. Motocross is a motorcycle sport that began in Europe following WWII, becoming popular in America during the 1960s. The sport features riders racing on specially designed bikes on closed courses with uphill, downhill, jumps, corners and/or other features. Freestyle motocross first emerged as its own sport in the United States in the late 1990s and has since grown to include Canada, Europe, Africa and Asia. The popularity of the sport is due in part to televised coverage from networks like NBC, which was the first major network to cover such sports . NBC’s first coverage came from the Gravity Games, which is an Olympic-like event for extreme sports ( including freestyle motocross ) in the summer of 1999. Gravity Games are television’s highest rated action sports program (16 of the top 20 broadcasts) and can be viewed in more than 50 countries. We were also treated to a private trails demonstration by Canadian National Trials Rider Champion Ryon Bell (see our interview with Ryon). Ryon demonstrated balance and precision at slow speeds over an obstacle course on his Gas Gas motorcycle. It takes a very steady hand and lots of practice and skill to perform very slow (even dead stop) speed maneuvers over barrels, ramps and more. With that amazing skill Ryon showed us what a Canadian Champion’s skills are all about! Leaving the special media presentation, it was time to hit the floor and see all there was to see. Which took us 3 days to see it all! 125 Booths, Tones of products and every major (and lots of minor) motorcycle manufacturers, vintage motorcycles, custom motorcycles, prize booths, riding clubs, magazines, motorcycle training companies, accessories, parts, helmets, jackets, tires, wheels, and so much more.. oh and don’t forget the food! All the new model 2004 motorcycles were there like the Kawasaki ZX-10R, Vulcan 2000, ZX-6RR and Z750, Suzuki GS500F, V-Strom 650, GSX-R600 and SV650 standard. Honda 599, Rune and CBR 1000RR and Yamaha Majesty 400 and FZ6. Moto-Guzzi Breva 750, Victory Kingpin and Vegas. Buell 1200’s, new Harley V-Rods, 883’s and 1200’s. So many new models, we as motorcyclists are very lucky this year to have so much selection!! – What makes it better than the other models. I wish I could talk about everything at every booth, but there is just way too much to list. I’m sorry, you will just have to go for the 4th Annual Calgary Motorcycle Show to see it all. As you can now tell, The 3rd Annual Calgary motorcycle show was a big success and we (as we as tens of thousands of visitors) look forward to seeing it next year! The Calgary Motorcycle Show is presented by MMIC (Motorcycle and Moped Industry Council), a national non-profit industry association that represents the major manufacturers and distributors of motorcycles and mopeds in Canada. – Canadian retail related sales for motorcycles, scooters and ATVs were close to $5 billion dollars per year, according to a survey conducted by the Motorcycle and Moped Industry Council (MMIC), and ending in February 2002. New vehicles made up $2.8 billion dollars of the total figure. – Motorcycle sales have gone up every year between 1992 and 2002 in the United States. – The Motorcycle Industry Council (MIC) from the United States, showed the age of American bikers increase from 27 in 1985 to 38 in 1998. Older Baby Boomers also tended to purchase cruiser?style bikes, which generally cost $15,000 and up. We found out what everyone always want to know but never does in advance! Find out what is coming and could be coming for the 2005 and 2006 models for the major manufacturers!! Inside industry motorcycle information, “secret” plans, 2005 and 2006 models, wow, you are in for a treat! Like the potential 2005 and 2006 Vegas Sport bike and Naked Standard with their V-Twin engine! How about a potential 2005 Kawasaki Vuncan 2000 touring bike!!! 10 hours at the show, talking to every manufacturer, squeezing every last bit of new bike story, rumor, upcoming bikes, and much much more! Why the 2004 models were developed, why they choose certain colours, what target market and demographics they were developed for and more! LOTS of inside industry rumors on what is going to come out, what they want to develop and so much more! Kawasaki’s special “hop, skip and jump” 3 year plan to put them ahead of everyone else and bring you bikes you’ve only dreamed of till now! Special inside information on the Triumph Rocket III, Kawasaki Vuncan 2000 and ZX10R and the Honda Rune!! Have you always wanted to write for a motorcycle magazine? Just looking for that lucky break? Yes, that is real. No joke, your story, your name, in print! Thanks for your support and for coming back time and time again to visit us.